Porta-Brace video camera case and Think Tank Photo roller bag. Planning, research and organization are essential. The first thing I do when given an assignment is start asking questions like, when, where, still, video, deadline. Next comes the logistics, such as will I fly or drive, be staying at a hotel or aboard a ship at sea, need a rental car or will I use my personal vehicle? Answers to these questions greatly impact what gear I need and how and what I will pack. Next begins the research phase of the trip. I start with the writer if one has been assigned and see what research has already been done. Sometimes a draft of the story has already been started. Next I'll contact the program manager or subject matter expert, introducing myself and requesting any and all background information they can provide. I also ask them what I can expect to see and if there are any restrictions when I'm on location. Never want to find out for the first time that cameras aren't allowed or something is classified when I arrive. Finally I print out my Gear Pack List. I'm big on lists and the only way to ensure that you have everything you need when you arrive is to make sure you pack it. 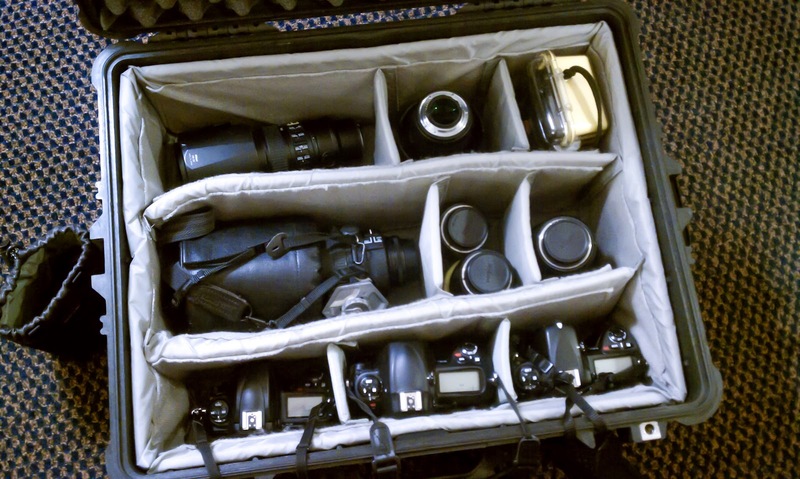 I downloaded this list several years ago from another photographer and over the years I've personalized it to include all the gear I own and everything else that I can think of. I just use a sharpie to cross out what I will not need for a particular trip and then use a red pen to check off items as they are packed. Hopefully you have the time to really contemplate what you are going to need, but even if time is tight, the list will ensure you are prepared. Many times it's a give and take, for instance, if I'm driving to location, it is easier to load more gear than I might need, however if I'm flying, then taking a small boat to meet a larger ship at sea, packing light and tight becomes more critical. Pelican 1610 case with 1615 padded divider. Most of my jobs require both video and still photography in some capacity, however, during initial conversation I have to determine which is primary. Is this part of a full video production with interviews and lighting requirements, or are they only interested in B-Roll and maybe a short clip for YouTube? For the latter I might be able to get away with just the D3S to shoot both still and video. 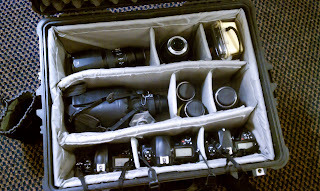 All my gear gets packed in either an Airport International Rolling Camera Bag from Think Tank Photo, a Pelican 1610 case with a 1615 padded divider set or a Porta Brace video camera bag. Other less breakable items such as a tripod, light stands, cords, light modifiers, chargers, etc., get packed into a soft duffel or regular luggage with clothes. And don't forget plenty of bubble wrap. I've checked all of these bags on different occasions, with the exception of the Porta Brace, and never had a problem. 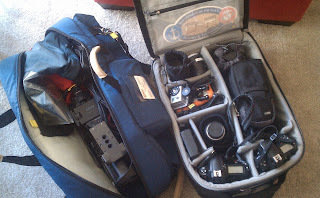 Although the Pelican hard case almost always pushes the weight limit. One last bit of advice. If possible arrive the day before the job starts to allow for lost or delayed luggage. It also gives you time to break out and check gear, get batteries on charge, etc. But just in case, I always travel with a laptop, compact flash card reader, one camera body and lens with flash in my carry on so I can at least capture something if all else fails. For advice from photographers who have traveled tens and hundreds of thousands of miles each year, Think Tank Photo has posted two free articles, "Fear for Your Gear - Part I," and "Fear for Your Gear - Part II" INTERNATIONAL TRAVEL. You need to provide your name and email address to gain access to the PDFs, but it is well worth it.